(CBS/AP) CAIRO - The health of ousted Egyptian president Hosni Mubarak deteriorated sharply on Tuesday, three days after a court sentenced him to life imprisonment in connection to the killing of protesters, a security official said. The official at Cairo's Torah prison said that Mubarak collapsed several times and that he was placed on mechanical ventilation after having difficulty breathing. He says the ousted president's condition worsened after a visit by his wife and former first lady Suzanne Mubarak on Monday, who sobbed after seeing Mubarak in a prison blue suit. Prison authorities turned down a request by Mubarak to bring two of his personal doctors to oversee his condition, the official said. However, they agreed to transfer his son Gamal, also a prisoner, to a nearby cell to be close to him. Other sources at Tora Prison Hospital tell the Egypt Independent publication that Mubarak has been suffering from severe depression. Mubarak "has lost weight and is having difficulty walking, but doctors managed to convince him to take his medicine, which he was initially refusing," according to the paper. Mubarak was sentenced Saturday for failing to stop killings of protesters in the 2011 uprising. His conviction saw him transferred to prison facilities for the first time. From his arrest in April 2011 until the announcement of the verdict, he has been in hospitals, first in his favorite Red Sea resort of Sharm el-Sheik and later at a suite in a military hospital on the outskirts of Cairo. Mubarak's sons Alaa and Gamal were acquitted on Saturday in corruption charges, but are still held over a separate trial in charges of insider trading. 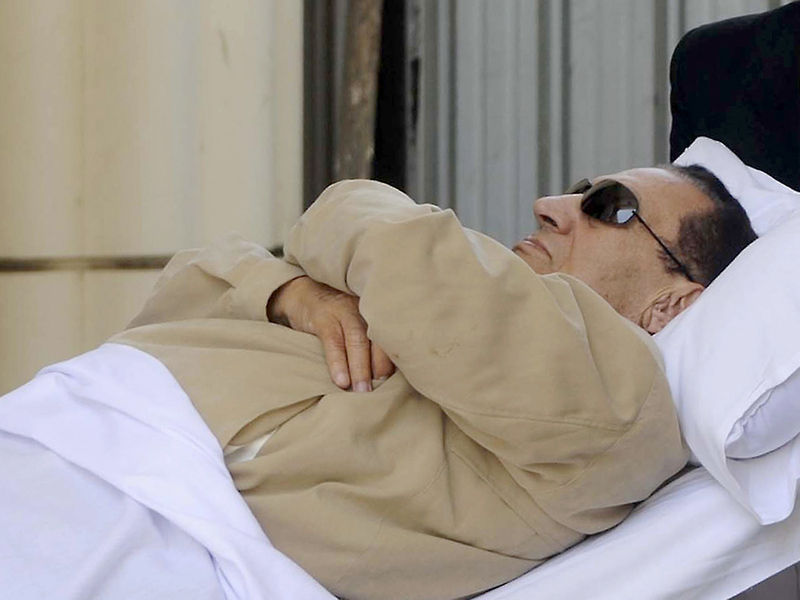 In his last public appearance at the trial on Saturday, the bedridden Mubarak sat stoney-faced in the courtroom cage. He wore dark sunglasses, concealing his eyes. His sons Gamal and Alaa looked nervous but reacted neither to the conviction of their father nor to their own acquittals. After the sentencing, Mubarak reportedly suffered a health crisis on the helicopter flight to a Cairo prison hospital. One state media report said it was a heart attack, but that could not be confirmed. The officials said Mubarak cried in protest and resisted leaving the helicopter. They said the former leader insisted he be flown to the military hospital on the outskirts of Cairo where he was held in a luxury suite during the trial. Mubarak finally left the chopper and moved to the prison hospital more than two hours after the helicopter landed. On Sunday, according to the independent daily al-Masry al-Youm, he told security officials that the military council who took over after his ouster had deceived him. "Egypt has sold me. They want me to die here," he reportedly said. The verdict sparked a new wave of protests by tens of thousands of Egyptians around the country who allege the verdict was determined by political pressure from the country's military rulers, doing a favor for their former president. They say the verdict as issued can be easily overturned in an appeal, and that the acquittals of six top security officials mean that killers of the protesters will remain unknown. Many hoped Mubarak or his top officials would be convicted of murder and receive the death penalty.